In these popular and effective residencies, an InterAct teaching artist works hand-in-hand with classroom teachers. 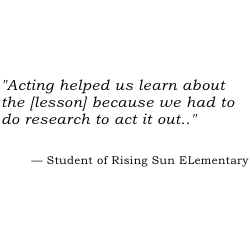 They plan lessons together integrating drama with the on-going curriculum. The teaching artist demonstrates a lesson and on succeeding visits co-teaches with the classroom teachers. The design of this residency follows the guidelines for best practice procedures for effective staff development. The residency has been implemented successfully in school systems nationwide. Please contact us for details. Many of our Professional Development workshops can be combined with student workshops to create an extended artist-in-residence experience that benefits students and teachers alike. This is often a great first step for schools and teachers who would like to explore arts integration in the classroom: An InterAct professional development workshop on a particular strategy, followed by a series of student workshops in which InterAct artists apply that strategy in the classroom, modeling the strategy for teachers so they can see it come to life with their students. Interested in knowing more? Please contact us!